SanDiegoVille: The Baked Bear Starts Catering Service | First Catered Party is Last 3 Padres Home Games! 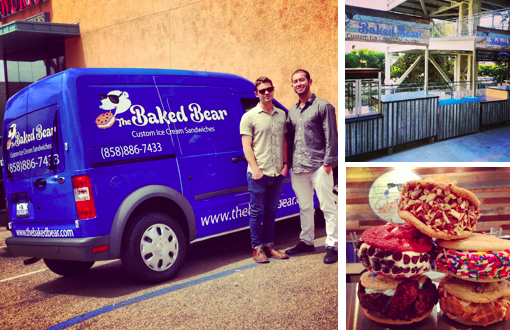 The Baked Bear Starts Catering Service | First Catered Party is Last 3 Padres Home Games! Take two warm cookies and bring them together with creamy, rich ice cream and you have yourself what many people have dubbed “the best idea ever.” From their Instagram following to their constant line out the door, The Baked Bear of Pacific Beach, has already become a San Diego staple, and now with the launch of a new catering line, partygoers will be able to enjoy The Baked Bear’s scrumptious menu in the comfort of their own fest. With a brand new “Baked Bear” wrapped van and portable refrigerated carts, San Diego will now see The Baked Bear on the go, starting this weekend at Petco Park! The brainchild of a lifelong ambition between San Diego natives and best friends Shane Stanger and Rob Robbins, The Baked Bear offers a modern take on an old-fashioned ice cream sandwich with made-to-order combinations of baked in-house gourmet cookies and California-crafted ice cream flavors. Waffle and brownie ice cream sandwiches, creamy milkshakes and chocolate dipped bananas are also on the menu. To start the catering business off right, The Baked Bear will be celebrating its new endeavor by being at the Padres game all weekend long (Friday, Sept. 20 - Sunday, Sept. 22). Forget the Cracker Jacks - find The Baked Bear at center field and right field at Petco Park. For more information about The Baked Bear, including the menu and hours, visit www.thebakedbear.com.